QUISPAMSIS, N.B. – It was wet and it was cold, but the smiles told the story at yesterday’s Run for Renee 5K race, as the 2018 series was wrapped up with the annual Halloween party. More than 50 participants turned out for the race, slightly exceeding the cap organizers normally put on the race. The Run for Renee, which raises money for the kidney foundation in memory of Strowbridge’s mother Renee, receives strong support from the local running community. 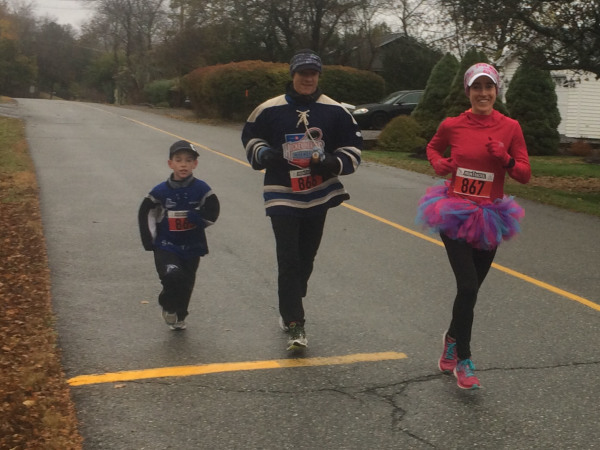 Eight-year-old Myles Doucet ran his first 5K race at yesterday’s Run for Renee 5K in Quispamsis, and is shown here running alongside his parents, Evan and Shelley. Meanwhile, Shelley Doucet was the top female finisher, coming in with a time of 18:24 alongside Alex Coffin. It was her first race since breaking her own provincial record at the Chicago Marathon earlier this month. After finishing the race, Doucet ran back and finished it again with her husband Evan and eight-year-old son Myles, who ran his first 5K race. All were wearing costumes for the occasion. Finishing second among females was Cassidy Griffin at 21:25, followed by this year’s female points series winner, Suzanne Doucet, at 21:53. She literally ran away with this year’s series, finishing the year with 278 points, followed by Charlene Smith with 184, and Sue Teakles with 179. Young was also dominant in the men’s series, finishing with 270 points, while Lee finished second with 209, and Charles Smith finished third with 188, edging Kevin Curnock by a single point. For complete results, visit the Run for Renee Facebook page here . For example, seven local runners competed in all seven of this year’s races, while several more took part in five or six of them. 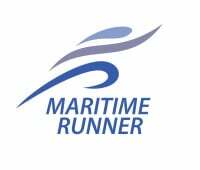 But the race, which is known for its fast course, also draws participation from outside the Saint John area each month. Yesterday’s race, for example, even included runners from outside the country, as one came from Maine and another came from Germany. The winner of the race was Justin Young, who came in with a time of 17:21. The victory also solidified his spot at the top of this year’s points series. Finishing second was Jeff Queen at 17:51, only a week after running last weekend’s Legs for Literacy marathon in Moncton. Young was out of reach within the first few seconds, according to Queen, who was side by side with Scott Lee for the first kilometer. It turned out it was actually Anderson Peters behind him, finishing third at 17:55.